Like Bornholm’s other medieval churches, Sankt (Saint) Ols was built in the 1100’s. It was named after the revered King Olaf II of Norway who fell at the Battle of Stiklestad in 1030. In 1378, it was documented as “Ecclesia sancti Olaui” (Church of St. Olaf). It first belong to the Archbishopric of Lund before coming under the Danish crown at the time of the Reformation. In the 1800’s it became fully independent. St. Ols is the highest of Bornholm’s four round churches, standing 13 meters from foundation to top of the conical roof. It’s built of local granite fieldstone with limestone door frames. Standing on a hilltop at a height of 112 meters (367 feet) above sea level, it was built as a stronghold to defend the surrounding area. Openings in the wall of the upper story were designed for shooting or throwing stones at the enemy. There was also a platform with a parapet used for defensive purposes. The church was also equipped with a hanging gallery supported on beams projecting from the walls of the round tower. The structure consists of a barrel vault and a central column bearing the upper floors. 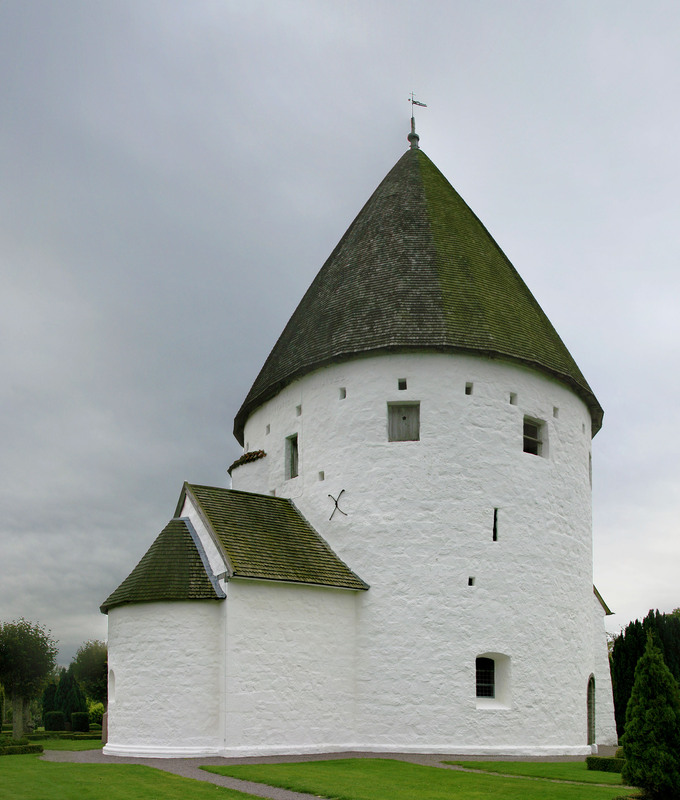 The height of the cylindrical nave, 13 meters, is almost exactly the same as that of Østerlars Church. There are small extensions from the nave into the small choir and tiny apse. The central column provides solid support for the first two stories but is more slender in the loft where it bears the more recent roofing. The porch is probably medieval while the two buttresses on the west were added in 1825 to guard against collapse. During restoration work in 1911 and 1950-52, frescoes were discovered in the nave and choir from at least three different time periods, oldest being 1300’s. They were in very poor condition, particularly in the nave. The early Renaissance pulpit dates from the first half of the 1500’s. The fairly recent oak gallery ringing the upper portion of the interior is unpainted.